The ‘Cost-Effective Resource Allocator’ is an Excel-based tool for supporting natural resource managers in deciding which management actions will generate the greatest benefit for threatened species in their protected area. The tool can help park managers anywhere in the world to choose actions that assist multiple species of concern. The philosophy of the tool relies on the idea of cost-effectiveness – how can a park manager obtain the biggest return on investment for species conservation from their limited budgets? Not only does it drive efficiency, it can be used to ask for new resources that will deliver the greatest return on investment. This research builds on a body of work by the University of Queensland and the Commonwealth Scientific and Industrial Research Organisation going back to 2008: including Joseph et al. 2009, Carwardine et al. 2011, Firn et al. 2015, and Di Fonzo et al. 2016 amongst others. This tool was developed in collaboration with Parks Australia using a case study of four species from Christmas Island National Park: a native fern (Pneumatopteris truncata), the Christmas Island Red Crab (Gecarcoidea natalis), the Golden Bosun (Phaethon lepturus fulvus), and Abbott’s Booby (Papasula abbotti). The research was supported by the Australian Federal Environment Department’s National Environmental Research Program funding scheme, the Australian Research Council Centre of Excellence for Environmental Decisions, and the United States National Science Foundation Decision, Risk and Management Sciences funding. The guide to the tool is published in issue 23.1 of the IUCN World Commission on Protected Areas (WCPA)’s journal, PARKS. This entry was posted in Australia, Expert elicitation workshop, National Parks, prioritization on April 20, 2017 by martinadif. Our paper analysing wildlife population declines is just out today in Journal of Applied Ecology! In this post Martina Di Fonzo discusses her paper ‘Patterns of mammalian population decline inform conservation action‘ published in Issue 4 of Journal of Applied Ecology, online today. Wildlife monitoring programmes play a key role in understanding ecological systems and this information forms the basis of many management decisions and conservation actions. Monitoring population declines, in particular, is an important step in tackling biodiversity loss, as severe population reductions anticipate species extinctions. In our recent paper, we explore how differences in the shape of mammalian wildlife population declines can act as useful trigger points within monitoring programmes, to highlight when and where rapid management intervention is required. This entry was posted in Uncategorized on July 15, 2016 by martinadif. I really enjoyed reading these tips about how to get the most from a postdoc. Thank you for blogging about this, Natalie! Feb 2016. It’s been over a year since I submitted my PhD thesis, and I’m finally starting to settle into postdoc shoes. Although I’m feeling relaxed about it now, I look back and realise that I felt very overwhelmed during the transition from PhD to postdoc. It came in waves, where I felt like I was totally on top of things and adapting really quickly to the new work and environment, to feeling like I was completely out of my depth. I had lost my safety net, and was starting to develop a serious case of imposter syndrome. This entry was posted in Uncategorized on March 2, 2016 by martinadif. Targets such as a species’ minimum viable population size or the optimum proportion of land that should be protected are important for translating the complexities of conserving natural resources into clear “rules of thumb”; however setting the same high-aspirational target across different species and landscapes may not be very efficient. Firstly, it is unlikely that distinct species will respond in exactly the same way to the same conservation target, which could result in unequal levels of protection and eventually lead to an overestimation in the amount of conservation achieved. Secondly, setting high-level targets will mean that fewer species can benefit from conservation funding when the budget available for these activities is limited. Our paper investigates this second point by evaluating the trade-off between carrying out intensive levels of conservation effort to provide a high level of persistence for a few species against applying lower amounts of effort across more species, resulting in greater numbers surviving at lower persistence levels. We carry out this analysis by modifying the species persistence target of a well-known framework for prioritizing management of threatened species, the “Project Prioritization Protocol” (PPP), which ranks species according to their cost-efficiency, and selects the set of species for conservation in order, until the budget is expended. We used a dataset of 700 threatened species from New Zealand (see three examples of these above!) with relevant information on the cost, likelihood of success, and the potential benefit of working on each species project as a case-study for our analysis. Specifically, we compared the conservation outcomes for our 700 species under different budgets when we reduced the PPP’s target from 95% down to 5% probability of persistence. Conservation outcomes were evaluated based on the ‘expected number of species saved’ in each scenario, which is a metric that takes into account the number of species prioritized for conservation management, their respective probabilities of persistence, as well as the total probability of persistence of all unmanaged species. Our study has two main findings (summarized in Figure 1): First of all, we show that is always better to set a high persistence target (above at least 75% probability of persistence) in order to maximise the expected number of species saved, no matter how low your budget is. Secondly, we find that the persistence level that delivers the highest conservation outcome is influenced by the available budget, such that lower budgets have slightly lower optimal targets. It is important to note that we identify a threshold target of 75% probability of persistence, below which it is never optimal to aim for. This finding demonstrates how the practice of undertaking low levels of management on more species (to give the impression of working on a wider range of species) can become inefficient when resources are spread too thinly. The key message of our study is that it is important to carefully consider what target to aim for in order to achieve the greatest conservation gains. We hope that our findings can be used to encourage conservation planners to maintain high targets (above 75% probability of persistence), and also lead them to question whether setting an overprecautionary goal of ensuring 95% probability of persistence is indeed optimal, considering their budget. Reference: Di Fonzo, M.M.I., Possingham, H. P., Probert, W.J.M., Bennett, J.R., O’Connor, S., Densem, J., Joseph, L.N., Tulloch, A.I.T., and Maloney, R.F. Evaluating trade-offs between target persistence levels and numbers of species conserved. In press in Conservation Letters. This entry was posted in Expert elicitation workshop, prioritization on September 29, 2015 by martinadif. There are four surviving species of gibbon in China today (eastern hoolock gibbon Hoolock leuconedys; black crested gibbon Nomascus concolor; Hainan gibbon N. hainanus; Cao Vit gibbon N. nasutus), all of which are threatened with extinction. In order to gain a better understanding of the processes that led to their heightened risk of extinction Sam Turvey, Jennifer Crees and I carried out an analysis of historical gibbon population records found in local Chinese gazetteers, dating back from the 1600s (the ‘Late Imperial’ period) to the present day. We found that northern and eastern gibbon populations disappeared first, followed by a progressive range contraction towards southwestern China (which is consistent with the ‘contagion model’ of range collapse). This pattern of loss can be explained by known patterns of regional human population density and demographic expansion during the Late Imperial period. Historically, northern China accommodated higher human population densities, followed by a migration of the ‘Han’ people to areas south of the Yangtze river from the mid-1500s onwards. Next, there was a westward expansion of people away from areas of high population density in the southeast, which lead to the progressive colonization (and encroachment on gibbon habitat) of the southern uplands by Ming and Qing Dynasty settlers (so-called ‘shed people’). Our study also highlighted a significant increase in the rate of gibbon population extirpation across China from the second half of the nineteenth century onwards, most likely in response to the well-documented destructive environmental policies and human population explosion that occurred during this period. Finally, our analyses identified that gibbon populations occurring at lower elevations in China have been more vulnerable to extinction as a result of greater historical human population growth and habitat conversion in these more accessible regions. In fact, today’s populations are largely restricted to medium/high-elevation montane forests. In addition to documenting the dynamics of past gibbon extinctions, we hope that our analyses of long-term Chinese gazetteer records can provide some important historical insights to inform conservation management of the country’s highly threatened remnant gibbon populations. Reference: Turvey, S. T., Crees, J. J., and Di Fonzo, M.M.I. Historical data as a baseline for conservation: reconstructing long-term faunal extinction dynamics in Late Imperial–modern China. In press in Proceedings of the Royal Society B. This entry was posted in Uncategorized and tagged Time series analysis on August 17, 2015 by martinadif. Jonathan Rhodes describes his new book chapter on “Dealing with overdispersion in ecological data”. Check out my chapter in Gordon Fox, Simoneta Negrete-Yankelevich, and Vinicio Sosa’s new ecological statistics book. 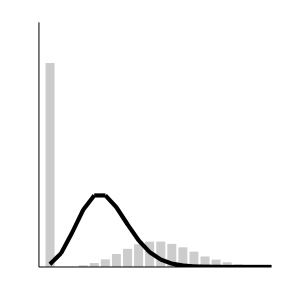 Ecological data rarely meet the assumptions of the standard probably distributions that are used in most statistical models – in particular, our data are often overdispersed (that is, the variance of our data is higher than can be acommodated by standard distributions). One particularly common source of overdispersion is zero-inflation where our data have too many zeros. See a previous paper of ours on zero-inflation here. But how do we deal with these types of non-standard data issues! This entry was posted in Uncategorized on March 16, 2015 by martinadif. As a follow on from my earlier post entitled “10 best reviewer comments in meme” and after having myself gotten some reviewer comments back last week, I would like to present 10 more memes from the website Sh*t my reviewer say. Enjoy! 1. 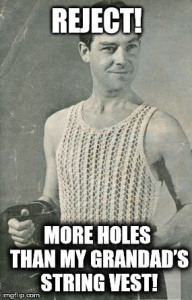 Reject – More holes than my grandad’s string vest! This entry was posted in Uncategorized on February 18, 2015 by martinadif.